Having the right drill bit sizes on hand for your particular repair or building task is essential for any seasoned carpenter or weekend-DIY’er. Knowing just what size you need to use for the hole you’re making is also important. It may not be totally evident at first glance. Many times, we’re just trying to find out the alternative sizes available if you’re working with metric sizes (measured in millimeters) versus standard or empirical values (our familiar fractional inch variety). TIP: Check out our full drill chart below for a quick reference to find all drill size equivalents. Finally, getting the right size drill bit set in your greater tool “chest” will arm you for the various types of projects you’re doing. We’ll discuss these in detail in this article. Scroll down if you just need a quick reference using our drill chart. How Many Drill Bit Sizes Are There? First things first. If you were to look at the most all encompassing collection of multi-purpose, twist-type bits, how many drill bit sizes would there be? Well, if you base your answer on how many size holes there are in the world, then there would be infinite amount of bits! Thankfully, we can narrow it down a bit to some standard sized holes and bits. Everyday home repair and construction projects, hobby, marine, farming, woodworking, metal working, aircraft, arts and crafts, commercial building projects, machinery and more. For each particular application area, you’re going to just see a few dozen or so relevant drill bit sizes. In fact, most nice sets include anywhere from 12-30 pieces of standard drill bit sizes. (And much more when you factor in different types of bits). Using our drill chart that follows below, you’ll get an idea of just how many sizes there are! Various bit types exist for a wide variety of applications, and in particular what material you’re drilling into. For the sake of simplicity, let’s look at a basic multi-purpose set. One that could serve any of the above mentioned disciplines well. Say, for example, a typical 29-piece set. In the following drill bit chart are the typical fractional sizes this kind of set would include. This would generally apply to many drill bit types, such as black oxide, titanium, carbide, high-speed steel and masonry (concrete), to name a few. There are indeed larger sets. Specialty fasteners sometimes call for a size that would be considered uncommon. Sets with even more varying drill bit sizes would include diameters smaller than 1/16″ or larger than 1-1/2″. In between in these large tiny and large sizes are every equivalent bit size known to “man”, so you always have the exact size needed depending on what you’re project is calling for. If you need drill bit sizes that are larger than 1″, you can often use a spade bit for wood and other soft materials. To avoid break-outs and chipping, you can stick to bigger round-shank types. How Do You Know What Size Drill Bits You Need? If you’re an average weekend-warrior, you’ve probably stared at a screw or bolt for a few moments and wondered what size drill bit you would need. Over time, you get so that you can literally eye-ball it and make an educated guess. But if you’re looking at a less common drill bit size, you need an aid to help you. A drill bit size hole card can be very helpful for this. 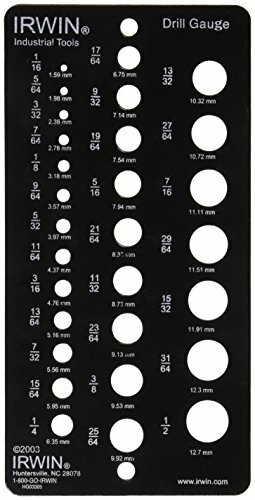 A simple plastic drill chart sheet with perfect round holes and markings on it lets you do a couple of things. First, you can size screws simply by inserting them into a hole then reading the marking. You can also size drill bits by pushing them through holes. This is especially helpful if you can’t read the engraved size markings on the bits. It’s also helpful to find the substitute bit size to cross over between metric and standard measurements. You can use the drill chart that follows this section to help convert sizes, or you can do the math yourself. To make things just a little more complicated, not all drill bit sizes are in north american fractional measurements. The metric system is used to define metric drill bit sizes as well. Even better is to get yourself a drill bit gauge. These handy cards can help you in a pinch, and can help you to quickly identify which size bit you’ll need based on the screw or hole size you need to drill out. Get one here! Best of all, they’re pretty inexpensive and will be something to have as part of your DIY toolbox for many years to come. As promised, here are a few drill bit charts to help you quickly convert all standard drill bit sizes to their matching measurements. If you’re tapping holes you’re pre-drilling you can check out our tap drill chart for specific size conversions. This chart lists the North American drill gauge sizes and converts them to their decimal equivalent in both inches and millimeters for metric sizes. NOTE: Below these charts is the standard fractional size conversion drill chart. This chart rounds out the second half of these number gauge sizes down to #1, which is the largest drill bit size. Letter gauge drill sizes are used primarily in North American with A starting with the smallest size working 26 size increments to Z. The following drill chart covers the smallest standard drill diameter size of 1/64 to 21/32 and gives you the equivalent sizes in both decimal inches and millimeters. This final drill chart covers the standard bit sizes from 43/64 to 1 27/64. Fractional sizing uses whole, half (1/2), quarter (1/4), eighth (1/8), sixteenths (1/16) and sixty-forths (1/64). For example, something just above 31/64″ would be a half-inch, and anything above 63/64″ would be a 1-inch drill bit size. Long bit sizes have typical lengths of: 12″ or 18″ overall length. These are handy in situations where you need to drill through thick or multi-layered materials. Professionals in the electrical industry for example will use these when running wires or cables through finished walls and ceilings. Other contractors will use masonry bits in their hammer drills to bore through materials such as concrete, stones and bricks. This is especially useful when creating a hole from the outside of your house to the interior. Lengths of up to 18″ or more may be needed. The typical sizes of drill bit point angles are 115° or 118° (degrees). When buying a good set, ensure it contains more than just one of the common (important) size drill bits. Bits do break as they weaken from usage and high amounts of heat generated from friction.